Am I a Co-Author or Just the Editor? This is Gayle Moore-Morrans blogging. We previewed most of the chapters of Ian’s children’s chapter book, “Jake, Little Jimmy and Big Louie” on this site last year and asked for some feedback from others as well as asking two of our great-grandchildren for input prior to publication – — Now-13-year-old Leland for consultation on the appropriateness of the book’s contents for his age group and now-8-year-old Hannah for some drawings to illustrate the book. In our post of March 21, 2013 I blogged Leland’s review entitled: “Wow!” A Recommendation for Ian’s blogged book, “Jake, Little Jimmy and Big Louie.” I’m now ready to re-scan Hannah’s illustrations for the book as I’ve edited them on Microsoft Paint. Our new printer – an HP OfficeJet Pro 8600 is finally installed and ready for me to do the layout. 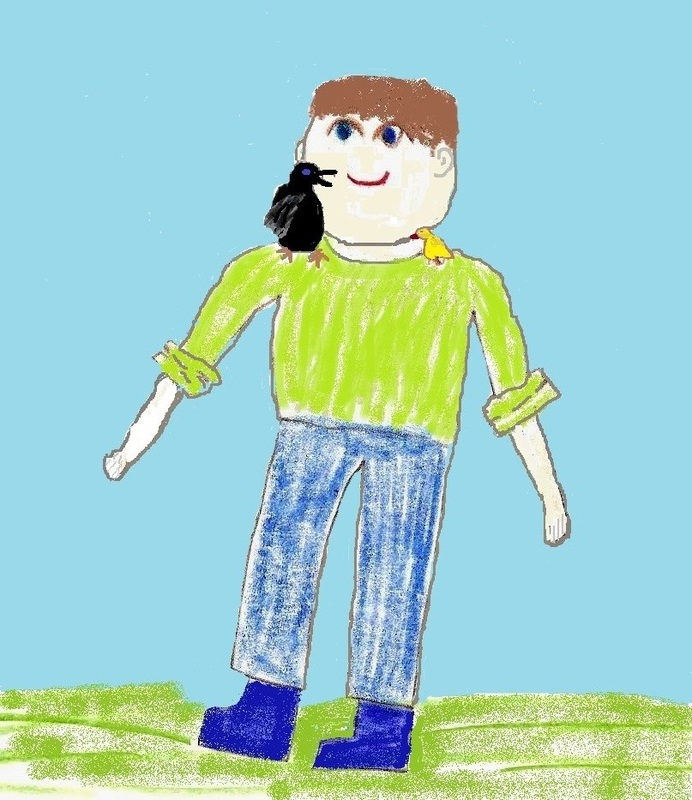 Here is a preview of the book’s cover illustration showing the boy Jake, and, on his shoulders, his BFFs, Little Jimmy the budgie and Big Louie, the raven. I’ve usually been identified as Ian’s editor, blogger, publishing and marketing person. How should we recognize my role in this children’s book that has evolved over the years it has been in the making? Am I just the editor or am I also the co-author? In our previous post I re-blogged a very helpful post by Francis Guenette on how she is writing with her mother even though her mother is no longer living. That prompted me to reply to her my thanks for answering a question that my husband Ian and I have been mulling over the past months. I found your remarks helpful when you stated, “I will put the book out in both our names and claim co-authorship for my mom’s stories – though her name will appear first. No matter the work I’ve done, the one who came up with the ideas and the characters deserves first billing.” So I’m feeling more at peace with the “by author with another author” claim. This entry was posted in Blogging, Blogging a book, Children's chapter book, Co-authoring, Editing, Illustrations, Inspirational story, Reblogging, self-publishing, Writing and tagged becoming a writer, birds, boy wanting a pet, children, Editing, family, independently published authors, pets, raising birds. Bookmark the permalink. Pretty good stuff. I will definitely bookmark your blog. nice and that i can think you are an expert on this subject. post. Thankss 1,000,000 and please carry on the rewarding work. Good content. I just stumbled upon your blog and enjoyed your blog posts. Anyway I will be subscribing to your feeds and appreciate their rapid accessibility.